Long before I started working with Lauren Conrad, I was a huge fan of her Kohl's collection. 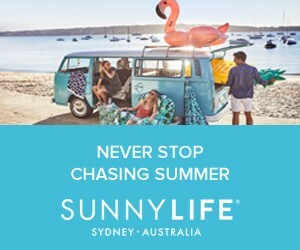 No matter the season, each collection is perpetually comprised of perfectly affordable options, offering everything from keepsake classics to fast fashion trends. My latest purchase was this coral embroidered top, which was screaming to be layered. Layering scoop neck blouses over sleeveless collared tops has always been a favorite style trick of mine. It's a great way to put more pieces from your wardrobe on display, while also portraying your personal style. Try layering trends this season like stripes and lace. The refreshing mixture is a fun way to add extra dimension to your spring ensemble. Below are some of my favorite pieces from the LC Lauren Conrad spring collection. Click the picture to shop your favorite piece! Lovely comfy and casual look! Love the blouse collar detail. Don't miss today my look with leather sleeves parka, distressed jeans and golden accessories......completed with asymmetrical shoes! I love LC collections! and I love your style!!! Cute outfit, do you ever think we'll tire of stripes? I hope not I still can't get enough! Love the button detail down the back of your top. Lovely outfit girl! You look gorgeous!! Really like the shirt and accessoiries!! Such cute outfit! LOVE the shirt! There's something about you that is so amazing: your smile is contagious! That is such a cute collar, I love the lace! First of all, I honestly don't think I have ever seen you wear something that I don't like. You always look pretty and polished and put together. 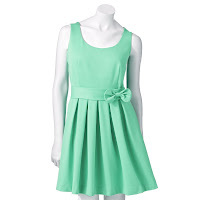 Love:) Second, I adore Lauren Conrad's collection at Kohl's as well. It is a special treat for me to go in there and splurge a little and I always love what she puts out there. 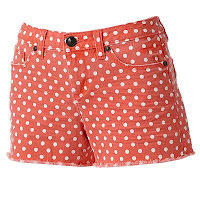 I have those polka dot shorts above (in navy) and many other pieces as well. She is just amazing! Love this look! The detail on the collar! Love! If you ever feel like donating to a good cause, my sad housewife closet would greatly appreciate the contribution. I always love her collection for Kohls, that coral shirt is so pretty! The detailing on the back of the striped top is too cute! 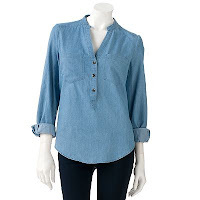 LC always has such great clothing items! This layer look is so simply and cute, but so chic! Such a cute look! Love the details on the neck of the coral blouse! I love striped tee over that blouse. You look beautiful! You look super cute Anna! Love the blue stripes & coral combo ! I love your green purse! It's the perfect way to add color to any outfit! The color of this coral top is such a cute detail, and I'm loving the different backs of the two tops paired together! Can't get over this outfit. You are so cute and stylish, Anna. So cute! I love layering! Read your article on Lauren Conrad today, and really enjoyed it. 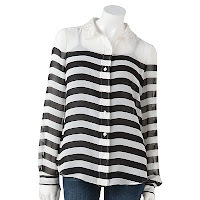 This look is my favorite, love the striped shirt over the blouse. Perfection! P.S. 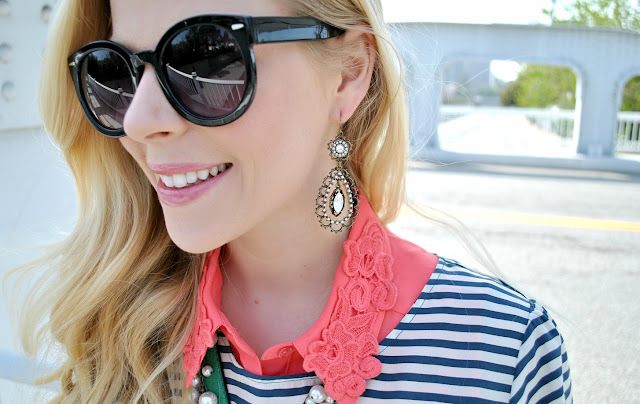 Make a stopover to Rhymes With Fashion to enter my Stella&Dot GIVEAWAY! Love this! Really love the lace and stripes together. Looking forward to more of your outfits and fashion tips. Hey Anna! This is the first time I've been to your blog - thanks for sharing! could I ask where you got your sunglasses in this post - they are so cute. ! LOVE this post! thank you so much for stopping by my blog, I almost died when I saw you commented! 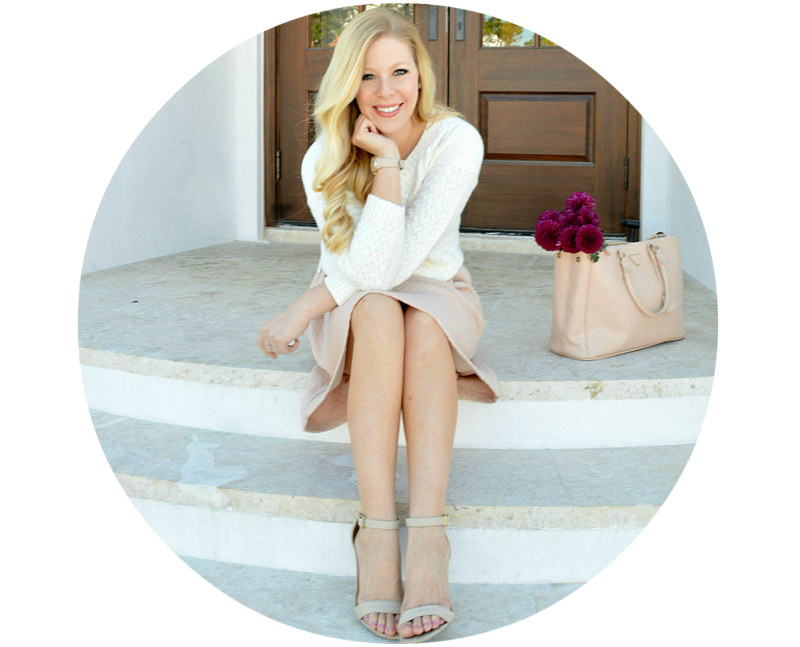 I voted for you in the lauren conrad blogger contest and am always stopping by your blog! I am literally always checking it, just realized I wasn't following you until today =) thanks again! Cute layered look, doll! Love the peppy Spring feeling. love this layering so so cute! You always look so great! Love that collar. It's so cool how you layered everything! PS - miss you on my blog. Stop by sometime! That embroidered top is beautiful. This is definitely some lovely layering. 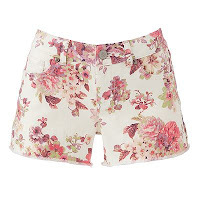 I think my favorite piece of the LC ones you're showcasing would definitely be those floral shorts - I absolutely love them. Love this layering!!! You make it look so effortless!! And I have so much from the LC line at Kohl's....her stuff is fun & fresh! Looking gorg! Such a cute and comfy outfit...love how you added green into the mix with the purse! love this outfit and everything that lauren conrad designs- you wear it well! Love this outfit! That striped top is a must have. I love this look!! The pop of green with the coral and stripes is perfect!! I love love love this layering!! Love the sheer drapes hanging down the back and the buttons! 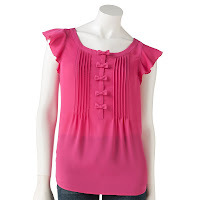 I love how you layered this top.. super cute and the color is great with the blue stripes! Hello gorgeous girl! I never would've thought to layer these two tops like this. I have two similar ones and will definitely be giving this trend a try. So cute! Thanks for stopping by today and for your super sweet comment. Beautiful and this is a great look. I have a crush on anything strippy and no doubt I like how you atch it with this pink collar! I like the casual classy outfit you are wearing today! the buttons in the back are too cute! Love this look. FAbulous. You make everything look good, even a casual look. LOve LC"s collection as well. I have been following you for quiet some time now, so needless to say I was pretty excited when I saw you had noticed mine! This is gorgeous Anna, I love your blouse! Adorable look Anna. I love your styling trick! Love the casual look .. Thanks for stopping by and checking my blog http://ithinkiloveit2.blogspot.com/. I am following you now, it would be great if you can follow me back. I love this layered look!! This is layering done right! The lace detail on the outfit gives it extra bonus points. Super cute outfit! Love the pop of green with your bag! You look adorable ! Love that blouse ! Super cute! That layering is fab! This is such a cute look! I really like how it can easily go from midweek wear to weekend wear. Also, I love your tip on layering scoop neck blouses over sleeveless collared tops. I will have to try that soon! This is gorgeous!! So glad you stopped by my blog!! I'm loving your blog! 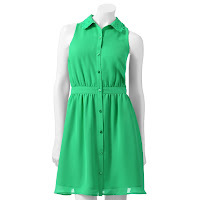 I love Lauren Conrad's Kohl's collection. I love both the striped shirt you are wearing and the striped button down you picked out. Also, the jewelry you are wearing is super cute. Great layering! I love the striped top and floral shorts from the collection. You're so pretty! Thanks for the visit and the lovely comment! 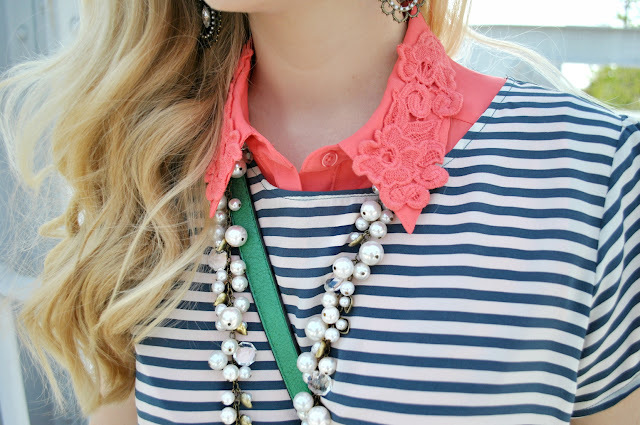 The collar of your coral shirt is gorgeous and I think it went wonderfully with the striped top! I have to check out Lauren's collection. 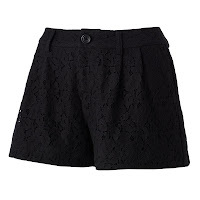 Your top is gorgeous and I am obsessed with those polka dot shorts! gorgeous outfit! 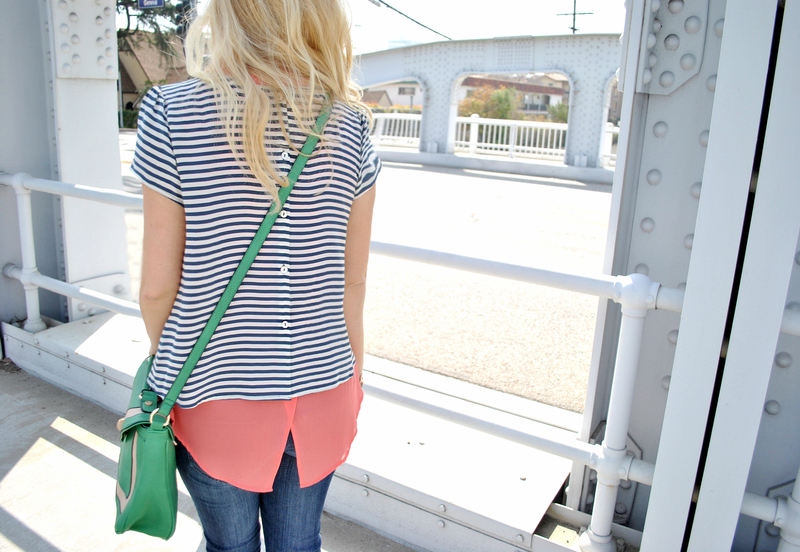 i love the pink of the blouse paired with the pop of green of the bag and the black and white stripes! perfect styling! Anna - this is one of my favorite of your looks! The striped top is so fun and I love the coral top peeking! Everything is about this is perfection! I like your outfit, it looks a bit hippie because of the jeans... maybe I'm wrong. One thing is certain. You look great in it. This outfit totally inspires me! I love how you layered here! I really love this layering look you put together! !